Have you ever wanted to learn how to surf, but do not know where to start? If surfing is a new sport for you, it can be kind of overwhelming not knowing all of the proper gear to use. When it comes time to choosing a board to learn on, you will see all different types of surfboards with varying shapes and sizes. This board made it to the top of our list when we ranked the best foam surfboards available today. In this Wavestorm surfboard review, you will see why it is one of the best surfboards for you to paddle out on when you are first learning how to surf. You want to take out a board that is safe, buoyant, easy to paddle, and can almost guarantee that you will be able to stand up your first time surfing. If you are a beginner surfer or are looking for a board for someone else who is, then you are looking in the right place! 1.4 Who is this perfect for? 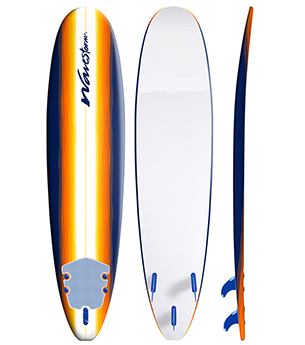 The Wavestorm is a classic 8’ surfboard that is easily recognized. It often has blue and white colors that come with three plastic fins, an attached stomp pad, and a leash. A Wavestorm is perfect for someone who is learning how to surf. These boards are very easy to stand up on and decrease your chances of falling, getting frustrated, and never wanting to get back in the ocean. Your odds of becoming injured are very small since the board is soft and not hard like traditional surfboards. All in all, if you are a beginner this board is safe, easy, affordable, and a great board for a beginner. When you first see this surfboard, it looks big and buoyant. The Wavestorm is specifically designed to be a board that will easily stay afloat and easily glides through the water when you paddle. Each time to do a stroke on a Wavestorm, you can feel yourself coast above the water whereas other surfboards feel like you drag through the water. This board has the dimensions of 8’x 22” x 3”, meaning it is long, wide, and thick. The Wavestorm has a rounded nose, square tail, and heavy rocker. This style of board aids in preventing someone from nose-diving, board maneuverability, and buoyancy. When in the correct spot on this board and in the correct position of the wave, it is very simple to stand up. As for the actual materials used to make this surfboard, Wavestorm uses a 4mm Foam EBS™- IXL Elastomer Barrier Skin, an HDPE (High-Density Polyethylene) High Impact Bottom, and a Superior Grade EPS Core (Expanded Polystyrene) with 3x epoxy set marine-ply stringers. In other words, this board is built to take a beating all while being lightweight and float really well. When it comes time to buying a Wavestorm, it doesn’t just come as the board like most new traditional surfboards. The board comes with a handful of needed accessories. It includes three plastic fins for the thruster set up, a stomp pad, and a leash. The three fins that come along with the board are durable but flexible fins. They come unattached from the surfboard and have screw- like fin inserts (2 per fin) that attach to the fin. Within each fin, there are two holes that match internally match the fin inserts threading. These fins are very easy to insert and install to the surfboard. When your surfboard is moving through the water, the fins cut through the water giving you traction. Without them, the tail end of your board will slide out and you will spin out of control. This small accessory is essential to have on your surfboard. Another main accessory that comes with this board is the stomp pad. This is the part of the surfboard that is located on the top of the tail end of your board in between the two side fins. It is very noticeable because it is often a different color and texture as the top of the surfboard. This is another important accessory to your surfboard because your stomp pad is going to allow your back foot to grip onto the board when you stand up. This means no wax is needed! Score, one less thing you have to worry about. The stomp pad allows you to avoid slipping and falling resulting in more waves and more fun. Finally, the last accessory that comes with The Wavestorm is your leash. This may be one of the most important accessories that will come with your board. Your leash is usually the length of your surfboard or just shy of it and what it does is connect you to your surfboard. Why do you want to be connected to your board? Well, unless you are an ultra swimmer or have all the energy in the world, you are going to save a lot of your energy to focus on standing up for the first time rather than chasing after your board. Wavestorm makes a variety of different models that come in different colors, shapes, and sizes. For all of the models listed will vary based off of your personal preference in colors and what size board will vary based off of your body weight and height. First off, there is “The Classic.” This surfboard is the board that most people think of when they hear the words “Wavestorm surfboard.” This board comes in the sizes of 7 ft and 8 ft and is available in multiple colors with a gray stomp pad. Next, we can look at the “Original New Modern.” This model comes in the sizes of 7ft, 8ft, and 9ft and is only available in a solid Navy blue with a gray stomp pad. This board style is very similar to “The Classic” and rides the same; the only main difference that you will see are cosmetic. The color of the overall board varies but all in all, the “Original New Modern” is made very similarly. Surfing on the Wavestorm was pure fun! This was my first time surfing and it made it seem easy. After a few falls, I was up and riding! This was a great board to learn on. Where do I install the leash? When you insert your fins, will see one fin with a black loop attached. This is for the middle fin and should be closer to the tail than the other insert. This loop is where you will attach your leash to and should be on the top of your surfboard. On your leash there is a multi-fold velcro latch on it. Put it through the loop, fold it over properly, and give it a couple tugs to make sure it is attached. How do I install the fins? Installing the fins is easier than it looks. Each board should come with an instruction manual. The side with the two nobs coming off of the board will insert into the two holes of each fin slot. Each fin should have two inserts that come with and will look like a plastic screw with a big flat round top. Put them into the top of the surfboard after you placed the fins into to slots. Find a flathead screwdriver, if you don't have one you can use a quarter, and tighten the inserts to the fins. How do I keep care of my surfboard? Taking care of your surfboard is simple. If you want to keep it in the best shape possible, after every use give the whole board a rinse with fresh water. When you are storing it, try to keep it out an area that will not be exposed to direct sunlight. Both salt water and sunlight will ware down your board and cause it to fall apart. 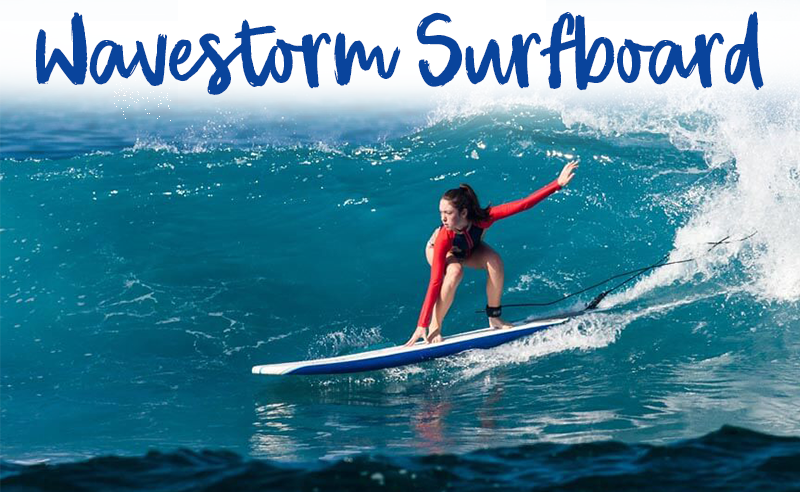 The Wavestorm’s warranty allows for you to receive surfboard repair or a new surfboard replacement if your surfboard has a manufacturing or material defect with 30 days of your purchase. This board must be an IGIT product and you must have proof of purchase. There are a handful of things that will disqualify you from the warranty such as tampering (drilling, cutting, etc.) and any sort of external source of damage like breaking in big surf or falling off of a car. Wavestorm surfboards are sold in many retail stores or can be found on multiple websites (Wavestorm Surfboards, Amazon, and sometimes Craigslist.) The most common store where Wavestorm surfboards can be purchased is at Costco. The Storm Blade model is another board that is similar to the Wavestorm. 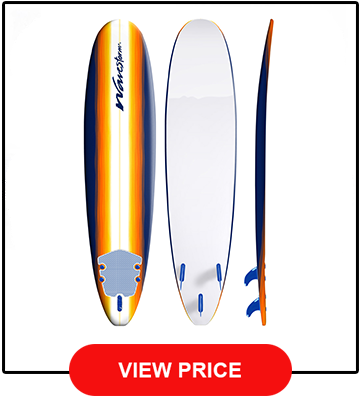 There is a larger variety of types of boards that are sold ranging from shortboard soft tops to stand-up paddleboards. However, this surfboard brand is not seen as commonly as the Wavestorm and can only be found online or in specific surf shops. Both are equally as good, but for someone learning how to surf, it would be the easier the accessibility they would only have to go to the nearest Costco to buy a board. Catch Surf is a brand that has gotten fairly popular in the past couple of years. These are the boards that you hear about professional surfers like Jamie O’Brien charging massive waves at Pipeline. They are great boards and also make a variety of styles of boards like smaller shortboards, custom shapes, and boards ranging from 7ft- 9ft. Catch Surf makes great boards but if someone were learning to surf they should wait for a little bit longer until they started to advance in their surfing to try out one of these boards. There are many noticeable differences between a longboard surfboard and a Wavestorm. The Wavestorm surfboard is softer, lighter, and more resistant to being dinged via dropping on the ground or bumping into walls. A longboard surfboard can be a little bit more difficult to transport if you are learning how to surf because it can be hard for a beginner to carry and seem very heavy. When it comes to getting in the water and catching waves, the Wavestorm has less of a risk of hurting someone else or yourself or in the water. It is light of soft so it is hard to cause much damage when you haven’t quite figured out how to control your board. If someone were on a longboard there first time out, they run the risk of running hurting others in the water, themselves, and damaging other people’s boards. A shortboard is a difficult board to know how to surf and is usually ridden by surfers who are a bit more advanced in their surfing. A Wavestorm is much easier because it is so buoyant and stable. When you stand up on a shortboard, you have to pop up fast, put your feet in the right position, and paddle into a steeper/ faster part of the wave. This doesn’t match up well with a beginner because it very easy to fall on a shortboard and can cause someone to be very frustrated. If someone has a pretty bad time surfing for the first time, then they are likey not going to want to keep trying to surf. The easier you can make your first time surfing, the better your experience will be. Overall, the Wavestorm is a perfect board for someone who is beginning to surf. Even if you are not learning to surf, they are a good board to have in your quiver best they are just plain fun and if you ever wanted to teach someone how to surf, you have the right board for them. When it comes to surfing for the first time, we have to recommend this board. It is one of the best boards out there to learn on and is known to be one that makes learning how to surf easier. We hope that this surfboard review has helped you to make a choice when it comes to buying your first surfboard. We hope you stay safe and have fun! Foam, Durable & Can Take A Beating While You Learn How To Surf! CenterForSurfResearch.org is a participant in the Amazon Services LLC Associates Program, an affiliate advertising program designed to provide a means for sites to earn advertising fees by advertising and linking to Amazon.com, Amazon.co.uk & Amazon.ca.